Incident Details: A couple coming off the hill came across a 75 year old gentleman who had “run out of legs”, and was rapidly becoming hypothermic, having been unable to move for some time. 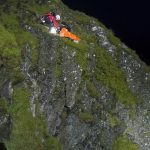 The couple raised the alarm, with the help of a couple of passing mountain bikers, but stayed with the casualty until the arrival of the Team, getting him into a survival bag, and trying to keep him warm. The Team were able to drive as far as Force Crag, and were then with the casualty within about 20 minutes. He was put into a casualty bag with hot pads, and then stretchered down to the Team vehicle. He was then driven down to the end of the mine road, by which time he had recovered enough to drive himself back to his hotel. All credit to the couple who stayed with him whilst the Team was mobilised. 15 Team members – 1 hour 49 minutes.